The applicant shall furnish a drawing where necessary for the understanding of the subject matter to be patented. When the nature of such subject matter admits of illustration by a drawing and the applicant has not furnished such a drawing, the Commissioner may require its submission within a time period of not less than two months from the sending of a notice thereof. Drawings submitted after the filing date of the application may not be used (i) to overcome any insufficiency of the specification due to lack of an enabling disclosure or otherwise inadequate disclosure therein, or (ii) to supplement the original disclosure thereof for the purpose of interpretation of the scope of any claim. 37 C.F.R. 1.81 Drawings required in patent application. (a) The applicant for a patent is required to furnish a drawing of the invention where necessary for the understanding of the subject matter sought to be patented. Since corrections are the responsibility of the applicant, the original drawing(s) should be retained by the applicant for any necessary future correction. (b) Drawings may include illustrations which facilitate an understanding of the invention (for example, flow sheets in cases of processes, and diagrammatic views). (c) Whenever the nature of the subject matter sought to be patented admits of illustration by a drawing without its being necessary for the understanding of the subject matter and the applicant has not furnished such a drawing, the examiner will require its submission within a time period of not less than two months from the date of the sending of a notice thereof. (d) Drawings submitted after the filing date of the application may not be used to overcome any insufficiency of the specification due to lack of an enabling disclosure or otherwise inadequate disclosure therein, or to supplement the original disclosure thereof for the purpose of interpretation of the scope of any claim. For applications filed on or after December 18, 2013, other than design applications, 35 U.S.C. 111 no longer requires that an application contain a drawing where necessary for the understanding of the subject matter sought to be patented to be entitled to a filing date. 35 U.S.C. 113 continues to provide, however, that "[t]he applicant shall furnish a drawing where necessary for the understanding of the subject matter sought to be patented" and that "[d]rawings submitted after the filing date of the application may not be used (i) to overcome any insufficiency of the specification due to lack of an enabling disclosure or otherwise inadequate disclosure therein, or (ii) to supplement the original disclosure thereof for the purpose of interpretation of the scope of any claim." Thus, the absence of any drawing on the filing date of an application where a drawing is necessary for the understanding of the subject matter sought to be patented may result in an applicant not being able to obtain a patent for any claimed invention presented in the application, but except for design applications, the absence of any drawing on the filing of an application no longer raises a question as to whether the application is entitled to a filing date. Pursuant to 35 U.S.C. 171, a design application (whether filed before, on, or after December 18, 2013) must be filed with any required drawing to be entitled to a filing date. The preparation of drawings for a provisional or nonprovisional application is prudent where a drawing is necessary for the understanding of the subject matter sought to be patented, and inclusion of such drawing(s) with the application on filing will help ensure that the requirements of 35 U.S.C. 113 are satisfied for any such claimed invention. For applications filed under 35 U.S.C. 111 before December 18, 2013, a drawing (where necessary for the understanding of the subject matter sought to be patented), or a high quality copy thereof, must be filed with the application. See pre-PLT 35 U.S.C. 111, 35 U.S.C. 113, and pre-PLT 37 CFR 1.81. In accordance with pre-PLT 35 U.S.C. 111, a specification and any necessary drawing(s) are among the requirements for an application to be given a filing date. The first sentence of 35 U.S.C 113 requires a drawing to be submitted where such drawing is necessary for the understanding of the invention. In this situation, the lack of a drawing renders the application incomplete and, as such, the application cannot be given a filing date until the drawing is received. The second sentence of 35 U.S.C. 113 addresses the situation wherein a drawing is not necessary for the understanding of the invention, but the subject matter sought to be patented admits of illustration and no drawing was submitted on filing. The lack of a drawing in this situation does not render the application incomplete but rather is treated as an informality. The examiner should require such drawings in almost all such instances. Such drawings could be required during the initial processing of the application but do not have to be furnished at the time the application is filed. The applicant is given at least two months from the date of the letter requiring drawings to submit the drawing(s). If the examiner discovers new matter in a substitute or additional drawing, the drawing should not be entered. The drawing should be objected to as containing new matter. A new drawing without such new matter may be required if the examiner determines that a drawing is needed under 37 CFR 1.81 or 37 CFR 1.83. The examiner’s decision would be reviewable by filing a petition under 37 CFR 1.181. The Technology Center (TC) Director would decide such a petition. The Office of Patent Application Processing (OPAP) will make the initial decision in all new applications as to whether a drawing is "necessary" under the first sentence of 35 U.S.C. 113. A drawing will be considered necessary under the first sentence of 35 U.S.C. 113 in all applications where the drawing is referred to in the specification and one or more figures have been omitted. The determination under 35 U.S.C. 113 (first sentence) as to when a drawing is necessary will be handled in OPAP in accordance with the following procedure. OPAP will make the initial determination as to whether drawings are required for the understanding of the subject matter of the invention. When no drawings are included in the application as filed and drawings are required, the applicant is so informed by OPAP. A filing date will not be granted if the application was filed under 35 U.S.C. 111 before December 18, 2013 and applicant will be notified to complete the application (37 CFR 1.53(e) ). If a drawing is later furnished in an application filed under 35 U.S.C. 111 before December 18, 2013, a filing date may be granted as of the date of receipt of such drawing. (E) at least one claim directed to an article, apparatus, or system where the sole distinguishing feature is the presence of a particular material (e.g., a hydraulic system using a particular hydraulic fluid, or a conventional packaged suture using a particular material). For a more complete explanation about when a drawing is required, see MPEP § 601.01(f). For applications submitted without all of the drawings described in the specification, see MPEP § 601.01(g). If an examiner determines that a filing date should not have been granted in an application filed before December 18, 2013 because it does not contain drawings, the matter should be brought to the attention of the supervisory patent examiner (SPE) for review. If the SPE decides that drawings are required to understand the subject matter of the invention, the SPE should return the application to OPAP with a typed, signed, and dated memorandum requesting cancellation of the filing date and identifying the subject matter required to be illustrated. The subject matter of this application admits of illustration by a drawing to facilitate understanding of the invention. Applicant is required to furnish a drawing under 37 CFR 1.81(c). No new matter may be introduced in the required drawing. Each drawing sheet submitted after the filing date of an application must be labeled in the top margin as either "Replacement Sheet" or "New Sheet" pursuant to 37 CFR 1.121(d). When requiring drawings before examination use form paragraph 6.23.01 with a PTOL-90 or PTO-90C form as a cover sheet. The subject matter of this application admits of illustration by a drawing to facilitate understanding of the invention. Applicant is required to furnish a drawing under 37 CFR 1.81. No new matter may be introduced in the required drawing. Applicant is given a TWO MONTH time period to submit a drawing in compliance with 37 CFR 1.81. Extensions of time may be obtained under the provisions of 37 CFR 1.136(a). Failure to timely submit a drawing will result in ABANDONMENT of the application. 1. Use of this form paragraph should be extremely rare and limited to those instances where no examination can be performed due to lack of an illustration of the invention resulting in a lack of understanding of the claimed subject matter. 2. Use a PTOL-90 or PTO-90C form as a cover sheet for this communication. Applicant should also amend the specification accordingly to refer to the new illustration at the time of submission of the drawing(s). This may obviate further correspondence where an amendment places the application in condition for allowance. (c) Identification of drawings. Identifying indicia should be provided, and if provided, should include the title of the invention, inventor’s name, and application number, or docket number (if any) if an application number has not been assigned to the application. If this information is provided, it must be placed on the front of each sheet within the top margin. Each drawing sheet submitted after the filing date of an application must be identified as either "Replacement Sheet" or "New Sheet" pursuant to § 1.121(d). If a marked-up copy of any amended drawing figure including annotations indicating the changes made is filed, such marked-up copy must be clearly labeled as "Annotated Sheet" pursuant to § 1.121(d)(1). (g) Margins. The sheets must not contain frames around the sight (i.e., the usable surface), but should have scan target points (i.e., cross-hairs) printed on two cater-corner margin corners. Each sheet must include a top margin of at least 2.5 cm. (1 inch), a left side margin of at least 2.5 cm. (1 inch), a right side margin of at least 1.5 cm. (5/8 inch), and a bottom margin of at least 1.0 cm. (3/8 inch), thereby leaving a sight no greater than 17.0 cm. by 26.2 cm. on 21.0 cm. by 29.7 cm. (DIN size A4) drawing sheets, and a sight no greater than 17.6 cm. by 24.4 cm. (6 15/16 by 9 5/8 inches) on 21.6 cm. by 27.9 cm. (8 1/2 by 11 inch) drawing sheets. (h) Views. The drawing must contain as many views as necessary to show the invention. The views may be plan, elevation, section, or perspective views. Detail views of portions of elements, on a larger scale if necessary, may also be used. All views of the drawing must be grouped together and arranged on the sheet(s) without wasting space, preferably in an upright position, clearly separated from one another, and must not be included in the sheets containing the specifications, claims, or abstract. Views must not be connected by projection lines and must not contain center lines. Waveforms of electrical signals may be connected by dashed lines to show the relative timing of the waveforms. (1) Exploded views. Exploded views, with the separated parts embraced by a bracket, to show the relationship or order of assembly of various parts are permissible. When an exploded view is shown in a figure which is on the same sheet as another figure, the exploded view should be placed in brackets. (j) Front page view. The drawing must contain as many views as necessary to show the invention. One of the views should be suitable for inclusion on the front page of the patent application publication and patent as the illustration of the invention. Views must not be connected by projection lines and must not contain center lines. Applicant may suggest a single view (by figure number) for inclusion on the front page of the patent application publication and patent. (l) Character of lines, numbers, and letters. All drawings must be made by a process which will give them satisfactory reproduction characteristics. Every line, number, and letter must be durable, clean, black (except for color drawings), sufficiently dense and dark, and uniformly thick and well-defined. The weight of all lines and letters must be heavy enough to permit adequate reproduction. This requirement applies to all lines however fine, to shading, and to lines representing cut surfaces in sectional views. Lines and strokes of different thicknesses may be used in the same drawing where different thicknesses have a different meaning. (m) Shading. The use of shading in views is encouraged if it aids in understanding the invention and if it does not reduce legibility. Shading is used to indicate the surface or shape of spherical, cylindrical, and conical elements of an object. Flat parts may also be lightly shaded. Such shading is preferred in the case of parts shown in perspective, but not for cross sections. See paragraph (h)(3) of this section. Spaced lines for shading are preferred. These lines must be thin, as few in number as practicable, and they must contrast with the rest of the drawings. As a substitute for shading, heavy lines on the shade side of objects can be used except where they superimpose on each other or obscure reference characters. Light should come from the upper left corner at an angle of 45°. Surface delineations should preferably be shown by proper shading. Solid black shading areas are not permitted, except when used to represent bar graphs or color. (n) Symbols. 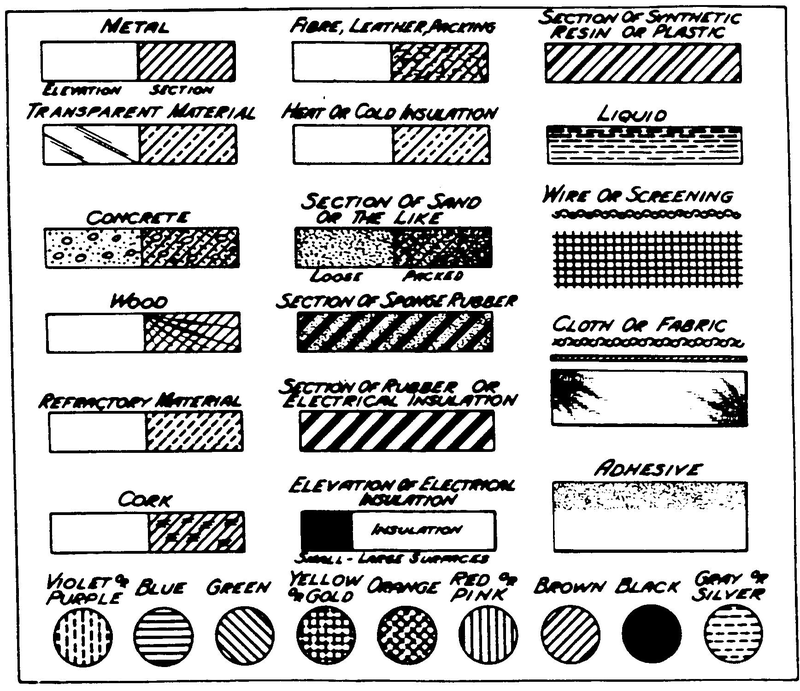 Graphical drawing symbols may be used for conventional elements when appropriate. The elements for which such symbols and labeled representations are used must be adequately identified in the specification. Known devices should be illustrated by symbols which have a universally recognized conventional meaning and are generally accepted in the art. Other symbols which are not universally recognized may be used, subject to approval by the Office, if they are not likely to be confused with existing conventional symbols, and if they are readily identifiable. (3) Numbers, letters, and reference characters must measure at least.32 cm. (1/8 inch) in height. They should not be placed in the drawing so as to interfere with its comprehension. Therefore, they should not cross or mingle with the lines. They should not be placed upon hatched or shaded surfaces. When necessary, such as indicating a surface or cross section, a reference character may be underlined and a blank space may be left in the hatching or shading where the character occurs so that it appears distinct. (q) Lead lines. Lead lines are those lines between the reference characters and the details referred to. Such lines may be straight or curved and should be as short as possible. They must originate in the immediate proximity of the reference character and extend to the feature indicated. Lead lines must not cross each other. 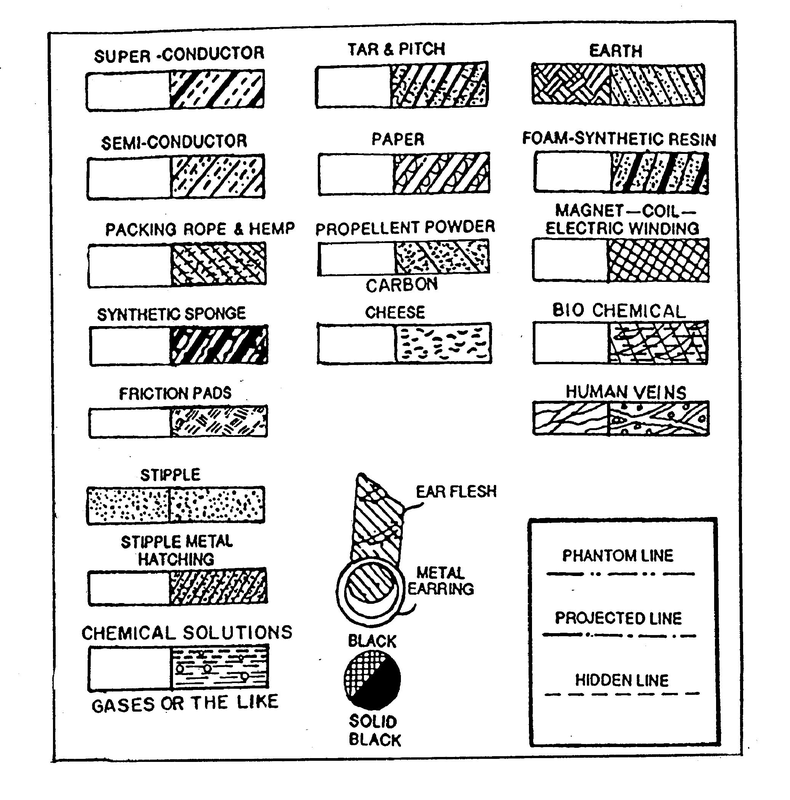 Lead lines are required for each reference character except for those which indicate the surface or cross section on which they are placed. Such a reference character must be underlined to make it clear that a lead line has not been left out by mistake. Lead lines must be executed in the same way as lines in the drawing. See paragraph (l) of this section. (s) Copyright or Mask Work Notice. A copyright or mask work notice may appear in the drawing, but must be placed within the sight of the drawing immediately below the figure representing the copyright or mask work material and be limited to letters having a print size of.32 cm. to.64 cm. (1/8 to 1/4 inches) high. The content of the notice must be limited to only those elements provided for by law. For example, "©1983 John Doe" (17 U.S.C. 401) and "*M* John Doe" (17 U.S.C. 909) would be properly limited and, under current statutes, legally sufficient notices of copyright and mask work, respectively. Inclusion of a copyright or mask work notice will be permitted only if the authorization language set forth in § 1.71(e) is included at the beginning (preferably as the first paragraph) of the specification. (y) Types of drawings. See § 1.152 for design drawings, § 1.1026 for international design reproductions, § 1.165 for plant drawings, and § 1.173(a)(2) for reissue drawings. See MPEP § 608.02(b) for information pertaining to the acceptability of drawings. Note that good quality copies are acceptable if the lines are uniformly thick, black, and solid. Each drawing sheet submitted after the filing date of an application must be identified as either "Replacement Sheet" or "New Sheet" so that the Office will recognize how to treat such a drawing sheet for entry into the application. See 37 CFR 1.84(c). Corrections to drawings must be made in the form of replacement sheets labeled, in the header, "Replacement Sheet" since the Office does not release drawings for correction. See 37 CFR 1.85. If a marked-up copy of any amended drawing figure, including annotations indicating the changes made, is filed, such marked-up copy must be clearly labeled as "Annotated Sheet." Black and white drawings are permitted to be transmitted by facsimile if the drawings are being submitted after the filing date of the application. Applicants should ensure that the facsimile transmission process does not unreasonably degrade the quality of the drawings. Color drawings are not permitted to be transmitted by facsimile. See 37 CFR 1.6(d)(4). Drawings are currently accepted in two different size formats. It is, however, required that all drawing sheets in a particular application be the same size for ease of handling. For information regarding certified copies of an application-as-filed which does not meet the sheet size/margin and quality requirements of 37 CFR 1.52, 1.84(f), and1.84(g), see MPEP § 608.01, subsection III. For design patent drawings, 37 CFR 1.152, see MPEP § 1503.02. For international design reproductions, see 37 CFR 1.1026. Note that pursuant to 37 CFR 1.1061, the provisions of 37 CFR 1.84, except for 1.84(c), do not apply to international design applications. For plant patent drawings, 37 CFR 1.165, see MPEP § 1606. For reissue application drawings, see MPEP § 1413. For correction of drawings, see MPEP § 608.02(p). For return of drawings, see MPEP § 608.02(y). For amendment of drawings, 37 CFR 1.121(d), see MPEP § 714. The filing of a divisional or continuation application under the provisions of 37 CFR 1.53(b) does not obviate the need for acceptable drawings. See MPEP § 608.02(b). See MPEP § 601.01(f) for treatment of design applications without drawings or applications filed prior to December 18, 2013 without drawings and MPEP § 601.01(g) for treatment of applications filed without all figures of drawings or applications, other than a design application, filed on or after December 18, 2013 without drawings. A number of different terms are used when referring to drawings in patent applications. The following definitions are used in this Manual. Original drawings: The drawing submitted with the application when filed. Substitute drawing: A drawing filed later than the filing date of an application. Usually submitted to replace an original drawing that was unacceptable. Acceptable drawing: A drawing that is acceptable for publication of the application or issuance of the patent. Corrected drawing: A drawing that includes corrections of informalities and changes approved by the examiner. Unacceptable drawing: The Office no longer considers drawings as formal or informal; drawings are either acceptable or unacceptable. Drawings that do not comply with all of the form requirements of 37 CFR 1.84, e.g., because they are not on the proper size sheets, or the quality of the lines is poor, may be acceptable for the purposes of publication and examination if the drawings are readable and reproducible for publication purposes. An objection will generally only be made to a drawing that does not comply with the form requirements of 37 CFR 1.84 if the Office is unable to reproduce the drawing or the contents of the drawing are unacceptable to the examiner. Plan: This term is used to illustrate the top view. Elevation: This term is used to illustrate views showing the height of objects. Black and white drawings are normally required in utility patent applications. India ink, or its equivalent that secures solid black lines, must be used for drawings. See MPEP § 608.02(c) for information relating to the location of drawings in IFW applications. Black and white photographs, including photocopies of photographs, are not ordinarily permitted in utility and design patent applications. Photographs or photomicrograph printed on sensitized paper are acceptable as drawings, in lieu of India ink drawings, as are photographic images submitted via EFS-Web, to illustrate inventions which are incapable of being accurately or adequately depicted by India ink drawings, e.g., electrophoresis gels, blots, (e.g., immunological, western, Southern, and northern), autoradiographs, cell cultures (stained and unstained), histological tissue cross sections (stained and unstained), animals, plants, in vivo imaging, thin layer chromatography plates, crystalline structures, metallurgical microstructures, textile fabrics, grain structures and, in a design patent application, ornamental effects. The photographs or photomicrographs must show the invention more clearly than they can be done by India ink drawings and otherwise comply with the rules concerning such drawings. Black and white photographs submitted in lieu of ink drawings must comply with 37 CFR 1.84(b). There is no requirement for a petition or petition fee, and only one set of photographs is required. See 37 CFR 1.84(b)(1). To be acceptable, such photographs must be of sufficient quality so that all details in the photographs are reproducible in the printed patent. If several photographs are used to make one sheet of drawings, the photographs must be contained on a single sheet. See MPEP § 608.02(c) for information relating to the location of drawings in IFW applications. See MPEP § 1503.02 for discussion of photographs used in design patent applications. Color drawings and color photographs are permitted in design applications without the need for a petition. However, the specification of design applications filed under 35 U.S.C. 111(a) must include, or be amended to include, the reference to a drawing executed in color as provided for in 37 CFR 1.84(a)(2)(iii). Note that the drawing requirements set forth in 37 CFR 1.84 do not apply to nonprovisional international design applications, except for those set forth in 37 CFR 1.84(c). See 37 CFR 1.1061(b). Color drawings and color photographs are not accepted in utility applications filed under 35 U.S.C. 111 unless a petition filed under 37 CFR 1.84(a)(2) or (b)(2) is granted. Color drawings and color photographs are not permitted in international applications (see PCT Rule 11.13 ). Unless a petition is filed and granted, color drawings or color photographs will not be accepted in a utility patent application filed under 35 U.S.C. 111. The examiner must object to the color drawings or color photographs as being improper and require applicant either to cancel the drawings or to provide substitute black and white drawings. Under 37 CFR 1.84(a)(2) and (b)(2), the applicant must file a petition with fee requesting acceptance of the color drawings or color photographs. Color drawings and photographs must be of sufficient quality such that all details in the drawings are reproducible in black and white in the printed patent. Color photographs may be acceptable if the conditions for accepting color drawings and black and white photographs are met. One set of color drawings or color photographs is required if submitted via the Office electronic filing system, or three sets of color drawings or color photographs are required if not submitted via the Office electronic filing system (37 CFR 1.84(a)(2)(ii) ). The petition is decided by a Supervisory Patent Examiner. See MPEP § 1002.02(d). Color photographs or color drawings will be stored in SCORE and a black and white copy thereof will be stored in IFW along with a SCORE placeholder sheet. Color drawings or color photographs submitted in paper are also maintained in an artifact folder. Where color drawings or color photographs are filed in a continuing utility application, applicant must renew the petition under 37 CFR 1.84(a)(2) and (b)(2) even though a similar petition was filed in the prior application. Until the renewed petition is granted, the examiner must object to the color drawings or color photographs in the utility patent application as being improper. In light of the substantial administrative and economic burden associated with printing a utility patent with color drawings or color photographs, the patent copies which are printed at issuance of the patent will depict the drawings in black and white only. However, a set of color drawings or color photographs will be attached to the Letters Patent. Moreover, copies of the patent with color drawings or color photographs attached thereto will be provided by the U.S. Patent and Trademark Office upon special request and payment of the fee necessary to recover the actual costs associated therewith. If color drawings or color photographs have been filed, but the required petition has not, form paragraph 6.24.01 may be used to notify applicant that a petition is needed. Color photographs will be accepted if the conditions for accepting color drawings and black and white photographs have been satisfied. See 37 CFR 1.84(b)(2). 1. This form paragraph should be used only if the application contains color photographs or color drawings as the drawings required by 37 CFR 1.81. 2. This form paragraph should not be used in design applications. It is anticipated that such a petition will be granted only when the U.S. Patent and Trademark Office has determined that a color drawing or color photograph is the only practical medium by which to disclose in a printed utility patent the subject matter to be patented. It is emphasized that a decision to grant the petition should not be regarded as an indication that color drawings or color photographs are necessary to comply with a statutory requirement. In this latter respect, clearly it is desirable to file any desired color drawings or color photographs as part of the original application papers in order to avoid issues concerning statutory defects (e.g., lack of enablement under 35 U.S.C. 112 or new matter under 35 U.S.C. 132 ). See MPEP § 608.02(c) for information relating to the location of drawings in IFW applications. 37 CFR 1.84(n) indicates that graphic drawing symbols and other labeled representations may be used for conventional elements where appropriate, subject to approval by the Office. Also, suitable legends may be used, or may be required, in proper cases. The American National Standards Institute (ANSI) (www.ansi.org) and the International Organization for Standardization (ISO) (www.iso.org) are organizations whose numerous publications include some that pertain to graphical symbols,; the symbols therein are considered to be generally acceptable in patent drawings. Although ANSI and ISO documents and other published sources may be used as guides during the selection of graphic symbols for patent drawings, the Office will not "approve" any published collection of symbols as a group because their use and clarity must be decided on a case-by-case basis. Overly specific symbols should be avoided. Symbols with unclear meanings should be labeled for clarification. Since design patents protect the appearance of an article, the use of graphic drawing symbols in design patent applications to indicate a particular material is generally not appropriate and will not be approved unless the material contributes to the appearance of the article. In addition, because color drawings may now be filed in a design application without the need for a petition, the use of graphic symbols to represent color is generally not appropriate and will not normally be approved by the Office. See MPEP § 1503.02, subsection V, and MPEP § 608.02,subsection VIII, for the submission of color drawings in design applications. In utility patent applications, the following symbols should be used to indicate various materials where the material is an important feature of the invention. The use of conventional features is very helpful in making prior art searches.